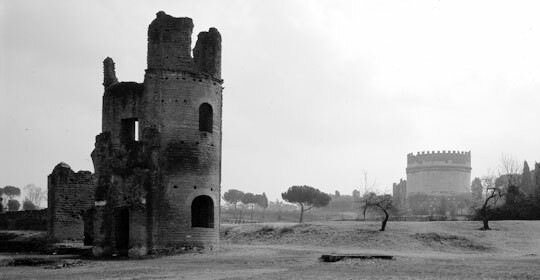 During the 20th century, the various administrative bodies concerned were keenly aware that more needed to be done to safeguard the monuments along the via Appia Antica and the exceptional landscape in which they were set and it was in 1926 in fact, that the Villa Maxentius complex was incorporated into the action plan being overseen by Rome City Council and the Ministry for State Education. Later, research that led to the 1941 plan regarding this complex, the Cecilia Metella monumental area that adjoined it and the Castrum Caetani, was carried out by architect Marcello Piacentini with a view to restoring the actual monumental structures and the grounds in which they were set and at the same time, enlarge and regulate the roads along which they were located. The advent of war meant that the original plan had to be set aside, although in 1943 the Council did go ahead with the expropriation of most of the monumental buildings and their grounds, effectively creating the archaeological area that exists today. The harsh economic reality of the times meant that during the post-war period the area continued to be rented out for agricultural use. It was only in 1960 that the first excavations and restoration work were carried out and has continued on regular basis ever since, although it was not open to the public until a documentary exhibition was mounted in 1980. Pending completion of the restoration of the structures within the mausoleum, the only parts of the archaeological complex currently open to visitors are the necropolis and circus areas that can be accessed via the 17th century de' Cenci Arch, which is also where the ticket office is located.